PyrOmould adhesive form tools are used for fast and neat application of PyrOnodes using high temperature epoxy putty. No clamping required, even when applied upside down. PyrOnodes must be physically attached to the object being monitored. The attachment should ensure good thermal conduction and be as close as possible to the point that may fail. Crimp lugs, P-clips, high temperature adhesives, heat shrink, tapes and lashing are some of the various methods that can be used. 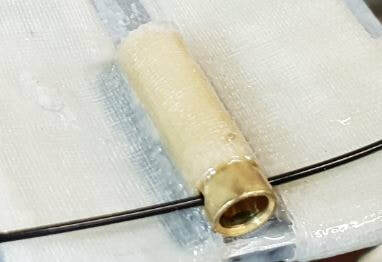 When a PyrOnode is attached to an insulating surface, such as the sheath of a cable, it should be noted that a temperature differential will exist between the conductor and outer insulation. This difference generally decreases as cable cross sectional area increases. PyrOnodes can be reset multiple times using our PyrOreset tool.